Today while playing on Pinterest I accidentally ran across this little quip. 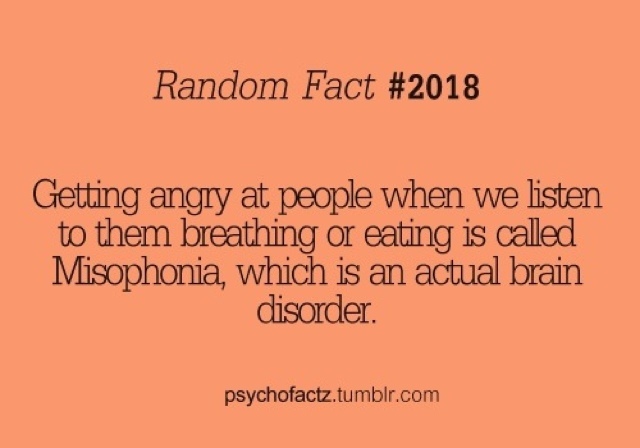 I laughed and then naturally Googled "misophonia." Jokingly I started reading the symptoms and discovered I have almost all of the symptoms except social repression. To my despair Michael diagnosed me with the disorder and informed me that blinking too loud is impossible, being annoyed by being awakened by the stirring of coffee is not normal, and that biting your fork when eating dinner is not the end of the world. It is a sad day in the McIlroy house (for me at least) Michael is happy to know he has proof that I am crazy. We've always known we were a dangerous combination because he is deaf and LOUD and I have super sonic hearing and I like my quiet. Despite our 'disorders' we are probably still one o the most in love and happy couples you will meet. There is no cure or treatment for misophonia. As of 5 minutes ago I informed Lacey that she and I will create the treatment and become well respected in the newly created field of misophonia. (he he he) Way to look at the glass half full right? !